In early August, my family and I took a vacation to the Cincinnati area of Ohio. Since we had half a day between switching from our regular hotel to the Great Wolf Lodge, we decided to take a small detour north to visit the Air Force Museum in Dayton. That worked out perfectly, because I had recently heard about the Amber Rose Restaurant and its haunted history! We decided to stop in for an early lunch before hitting the museum. 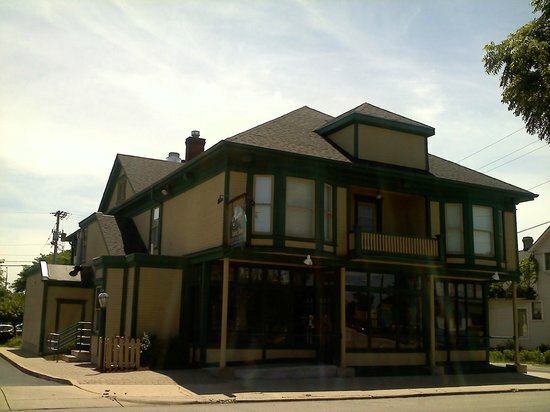 The Amber Rose is a beautiful, quaint restaurant in the heart of Old North Dayton. Since becoming a restaurant in 1990, it has specialized in Eastern European cuisine, as well as local favorites. I wasn't feeling great the day of our visit, but my potato soup and club sandwich were absolutely mouthwatering. Our waitress was the sweetest woman ever, and the prices were quite reasonable. It was a clean, friendly, and inviting place to spend the lunch hour, but you couldn't help but pick up on a century's worth of history in the building...a history that just might include a resident ghost. The building that houses the Amber Rose was built around 1910-1912 by Polish immigrant, Sigmund Ksiezopolski. 'Sig' and his wife, Emma, raised what I can gather from census records as five daughters and a son in the upstairs living quarters of what was then Sig's General Store and deli. Several of the daughters never married, and lived at home throughout their adult lives while helping out in the general store below. As a prominent immigrant family in the area, the home also served as a sort of community center and social club for the local Polish population. Sig's General Store and Deli remained in operation and family owned through the 1980s before being purchased around 1989 by a woman of Lithuanian descent, Elinor Sluzas. Unfortunately, before Elinor could open her restaurant, fire heavily damaged the building, causing part of it to be rebuilt. But, all would work out as the repairs were completed and Elinor's Amber Rose opened for business in 1990. Almost immediately upon opening the restaurant, Elinor noticed that something was slightly amiss. Her employees claimed that upon leaving the restaurant at night, they could see what appeared to be a young girl with long black hair and a white gown staring out the attic window. Staff and guests would also report dishes breaking for no apparent reason and the sounds of music, especially polka, emanating from an unseen place, heard often near the restrooms on the first floor. Slamming doors, mysterious balls of blue light, lights that turn on and off on their own, and other electrical disturbances are just a few of the spooky things that plague the Amber Rose staff. However, one of the spookiest things to have occurred was a full bodied apparition sighted by one of the cooks. He claims that an apparition appeared directly in front of him, lifted up her ruffled skirt slightly, and then walked away. What is weird is that surveillance camera footage taken at the same time clearly shows an anomalous light bounce through the kitchen. Is it the ghost? Maybe, or maybe not...but who IS the ghost said to be haunting the Amber Rose? In Chris Woodyard's book, Haunted Ohio III, Elinor relates an encounter that may shed some light on the situation. She ran into Rose Losko, one of the daughters of Sig Ksiezopolski, at the local supermarket and told her about the employees seeing the dark haired girl in the attic window. Rose told her that it must be "Chickee," a nickname for the youngest daughter of the family. Chickee had never married, and thus, spent her life living above the old general store and working there daily her entire life. What is strange is that all the census records and other family documents I've found state that ROSE was the youngest daughter in the family, lol. Some websites, however, claim that Chickee is actually Genevieve, who was the middle daughter. It is true that Genevieve never married and lived her life working for the family business. She passed away on October 15, 1983 at the age of 73 and is buried in the nearby Calvary Cemetery with her parents. Elinor has since retired from the restaurant business, but the current management keeps her original recipes. It seems like they've also held on to Chickee, as well as adding potential male ghost named 'Richard.' The restaurant hosts different paranormal events and has been the object of many paranormal investigations over the years. Come for the unique and delicious food, but stay for the chance to meet Miss Chickee, who hasn't quite let go of the family business yet.